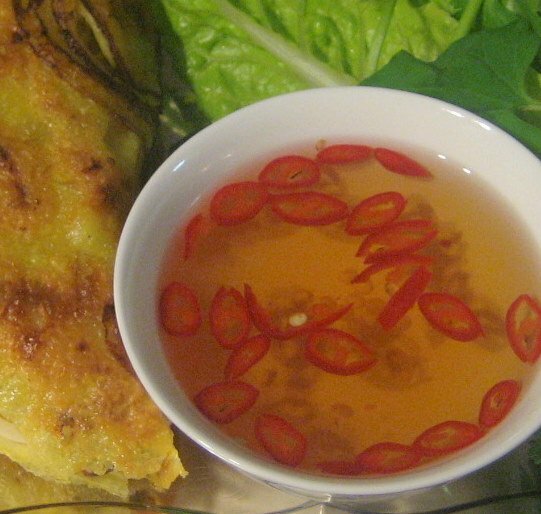 Banh Xeo (Vietnamese crepes) with nuoc cham sauce ! 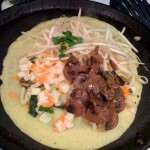 In the original recipe, the filling is cooked and added onto the non stick pan, and then the crepe batter is added to coat it all. I changed the method a bit and added crepe batter and cooked it a bit and then topped it with the filling. The Nuoc Cham dipping sauce can be made 1 day before. Mix all the ingredients in a bowl till all sugar dissolves and everything is combined well. Adjust sugar and spice levels according to taste. Cook the mushrooms and onions in 2 teaspoons oil in a pan for 10-15 minutes. Add in the salt and chilli powder to taste. In large bowl, add in all the veggies and the Nuoc Cham sauce and mix well. Let the mixture sit for half an hour before use. Prepare batter in a bowl by mixing in all the ingredients except oil. Heat 1 teaspoon oil on a non-stick pan and pour 1/4 cup batter on it and spread it by swirling or any other way you like. 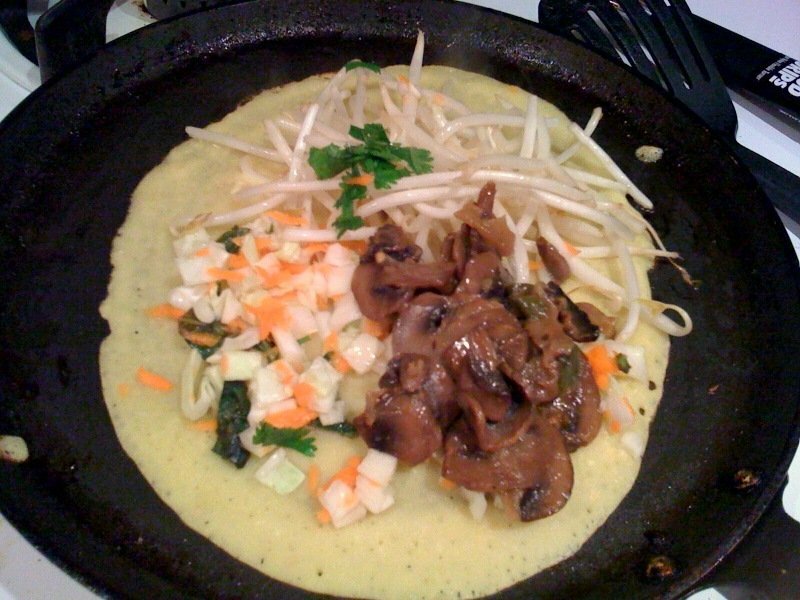 Top one side of the crepe with the filling(mushrooms or veggie or both) and top off the filling with bean sprouts and the fresh herbs(mint, basil and cilantro). 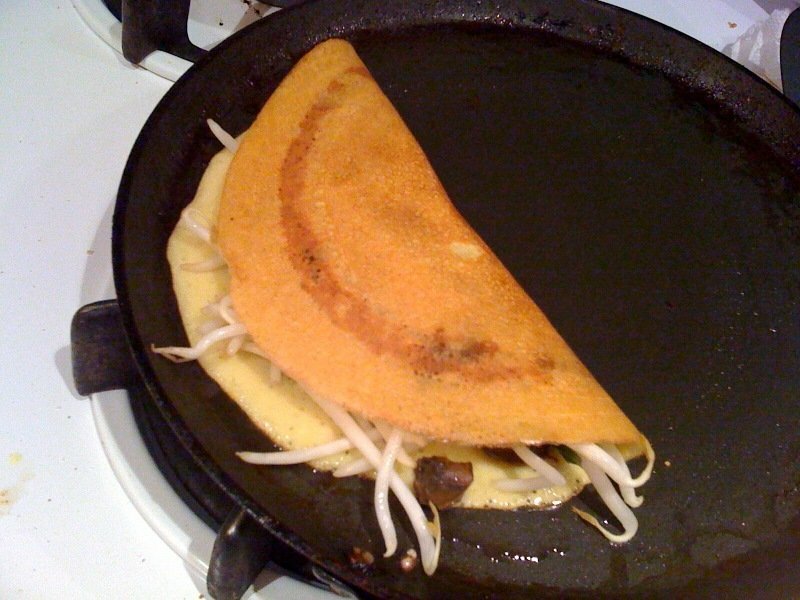 Once the crepe starts getting crisp and brown, fold it half over the filling and press down gently. Lift up the complete crepe and serve with lettuce leaves and the dipping sauce. The crepe is normally eaten by cutting a portion of the crepe and wrapping it in lettuce and the herbs and dipping in the sauce. Since i altered the recipe a bit, the herbs are already in the crepe, so the only wrap needed is the lettuce leaves! « Mango and Raspberry Wheat Bread! Hey! We are going to make these later today. We are excited! Are there ever carrot sticks in Nuoc Cham sauce? Do you have any suggestions for a homemade Nuoc Cham sauce because we normally can’t do prepackaged sauces because of ingredients we avoid. Thanks! Sorry…it was right there all along! Would help if I scrolled all the way down and read the whole thing~:-) Thanks! These were fantastic! A little bit of a learning curve for me on the GF crepes but I can slow on the uptake;) Used white rice flour and 1/2 cup brown rice. Needed to cook both sides until slightly brown before adding the filling or they would stay doughy on inside and crack when I folded it. Then put into a large lettuce leaf…genius! Loved the sauce and all the flavors. Just gorgeous. Thanks again! use a bit of chickpea flour instead of the rice flour. that will keep them soft if you are keeping then gluten-free, else use all purpose/self riding flour. Chickpea flavor… fantastic idea! I have said it before and will say it again…you are brilliant! Many thanks!